Talk about your “warm and fuzzy!” These are nifty little pencil sweaters! 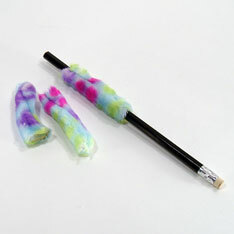 They slide onto a standard wood pencil or small barrel pens and mechanical pencils too. Perfect for warm prose. Smooth barrel pencils won’t roll away with these on! Easy on the fingers. Sold by the gross (144 pieces). Bagged 1 gross. $12.40 per gross (144 pieces). $8.10 per gross for 20 gross or more. $6.95 per gross for 40 gross or more.